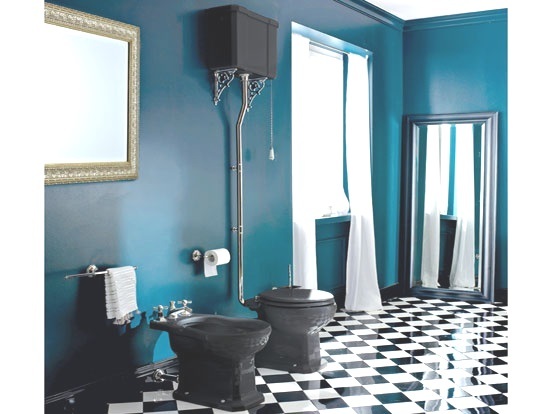 Coloured bathroom suites are on their way back! 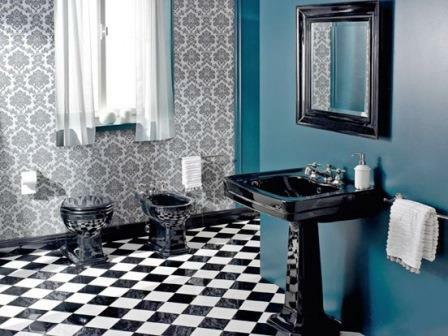 This Art Deco bathroom suite in black is simply stunning. 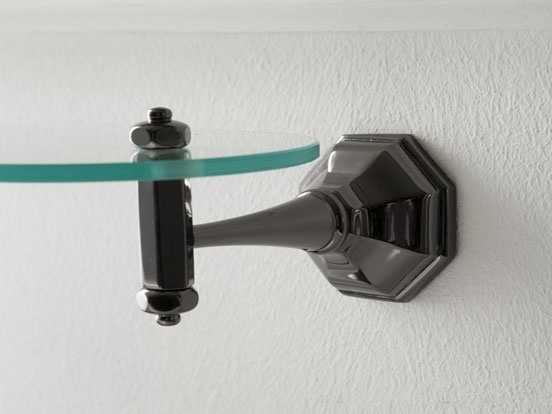 It was modelled on a 1930's original suite, and oozes Deco detailing. 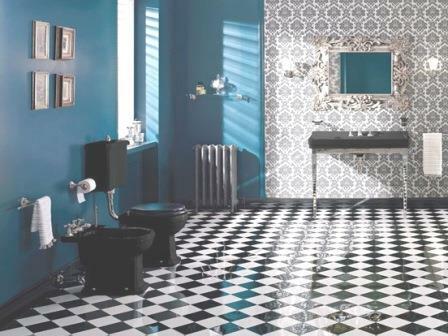 Combine pieces from the suite with a suitably styled & tiled interior for a stunning Deco bathroom. 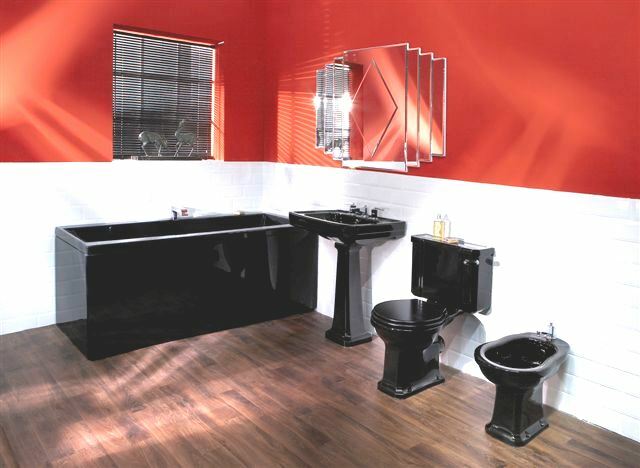 We would be happy to design your new bathroom to include this bathroom suite, please contact us for more information. The black bath measures 1700x750mm. 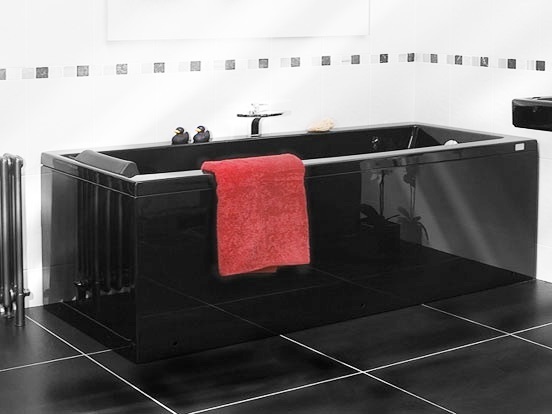 The black bath can be supplied with black acylic front bath panels and a black end bath panel as shown. 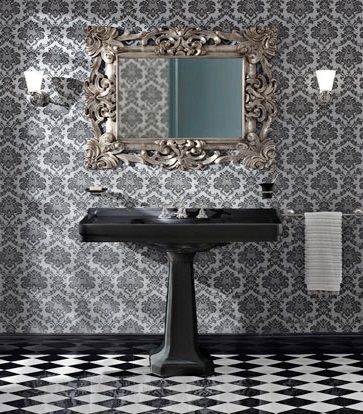 We could also make bespoke black laquered 'stepped' bath panel(s) for an even more authentic look. 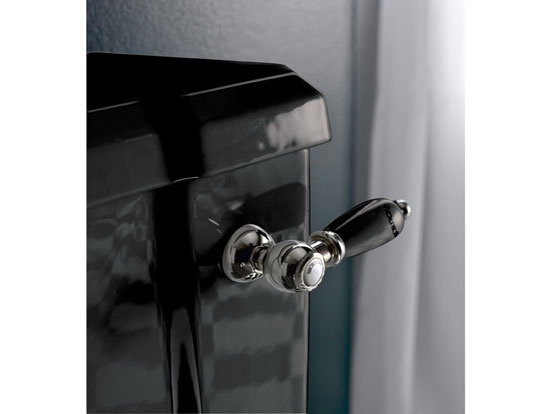 Black Art Deco Console Basin & Pedestal. 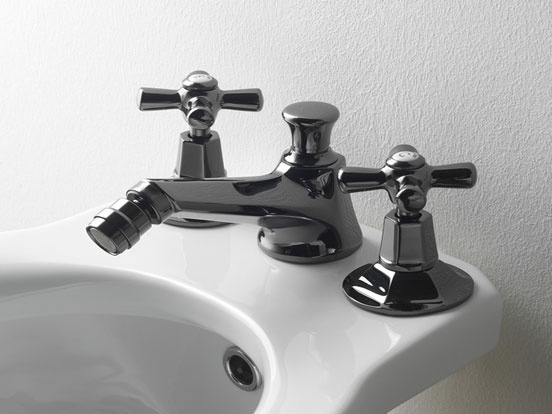 Basins are available in 580, 650 & 690mm sizes, with 1 or 3 tap holes. 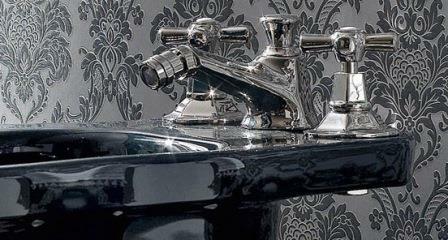 Neo Classical Art Deco console basin on pedestal with 3 tap holes, also available in 1 tap hole. 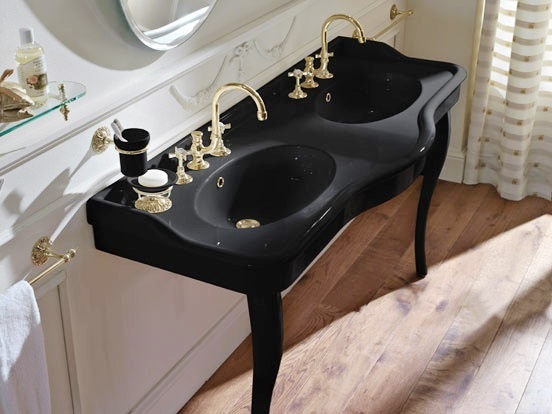 Double Console Basin in Black - The sumptious 1500mm wide black Palladio double console basin, with legs, is hand made from the original 1940's Sbordoni design. 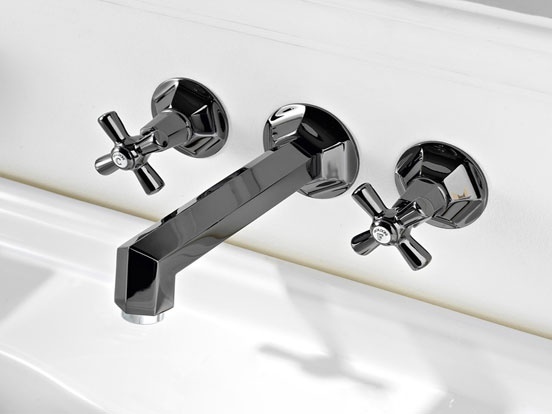 See our matching range of Deco brassware and bathroom accessories below. WC's; 3 versions shown in the photos are close coupled, low level & high level (with ornate cistern tank brackets) cisterns. 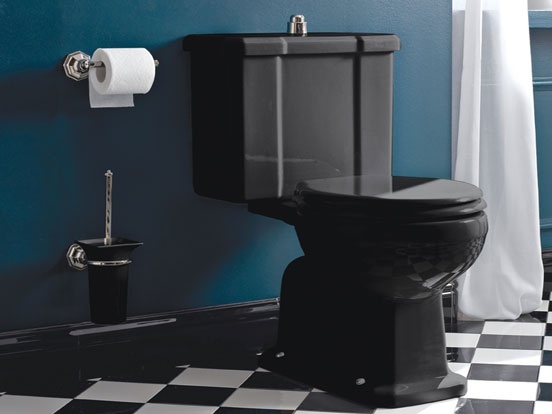 Both the black low level black toilets are available with a lever flush as well as a push button flush. 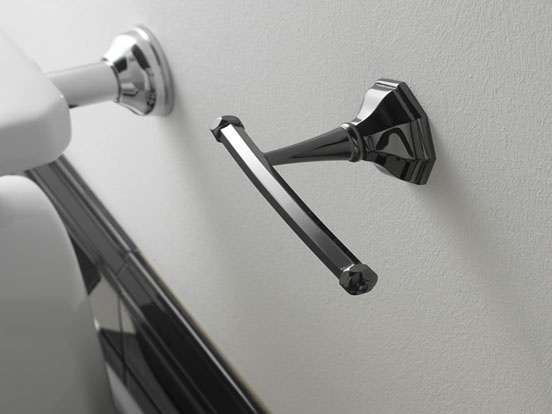 Finishes available for the seat hinges and push button & lever handle include chrome, gold, nickel, bronze, brass or copper. 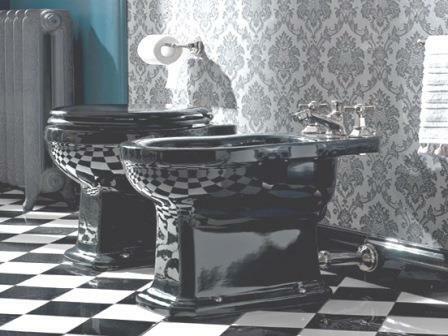 Art Deco Bidet in Black - available with 1 or 3 tap holes. 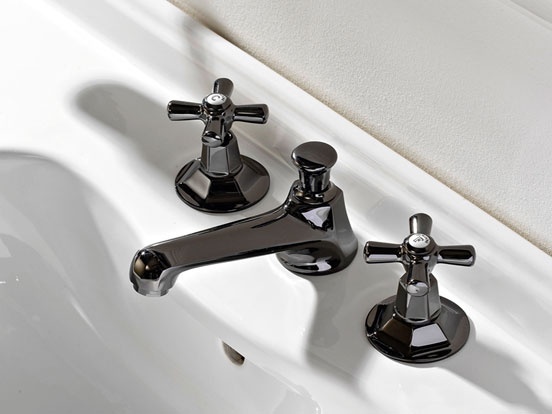 Matching Art Deco taps suitable for a 3 tap hole basin or wall mounted taps and spout for basin. Natural Brass, Chrome, Burnished, Nickel & Polished Brass finishes available. Art Deco bidet taps suitable for a 3 tap hole bidet. Natural Brass, Chrome, Burnished, Nickel & Polished Brass finishes available. Art Deco Toilet Roll Holder from Healey & Lord Ltd. Natural Brass, Chrome, Burnished, Nickel & Polished Brass finishes available.